ABOUT US Quicka Skips, in Wolverhampton, West Midlands, are a respected skip company that provides a skip hire service for both domestic and commercial rubbish removal. Homeowners, tradespeople, builders, landscapers, and warehouses rely upon our dependable service when completing home renovation, construction, or simply removing rubbish from their property. We pride ourselves on tending to our customer's needs and providing a service that is second to none. SKIP HIRE Quicka Skips understands that the one-size-fits-all service provided by many skip companies is ineffective for the majority of homeowners and businesses. 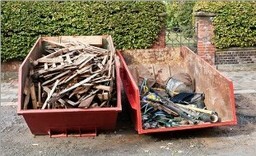 To ensure that we provide the perfect solution to your waste removal problems, we offer skips in a variety of sizes, ranging from 2 cubic yards to 16. For those that require a swift service, or are unable to leave a skip in place overnight, we are often able to arrange for skips to be delivered and collected on the same day. Should you require same-day skip delivery on a Friday, place this order as early as possible, as this tends to be our busiest day. Many areas have restrictions on where skips can be placed, or require a council permit for placement on the footpaths or roads. Quicka Skips will advise you of the regulations in your area and, in many cases, we are able to obtain the required council skip permit for you.